Seeing Ink Spots: An Addicting Technique -- Black Magic! An Addicting Technique -- Black Magic! 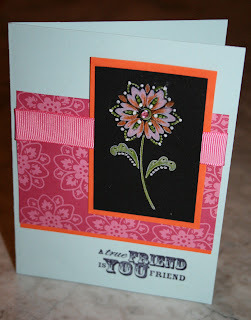 Here is a card from a couple classes back. The technique is called "Black Magic" and it is super fun. To achieve this look: first, stamp a bold image with Craft White ink, let it dry or heat set for a quick dry, then color directly over the white image with Pure Color Pencils. Try blending and layering color over color for an awesome effect. All supplies are from SU! I tell ya, this technique is addicting. Go stamp and have fun. Oh your card is sooo beautiful!! I love the flower!!! I have not hear of this technique! 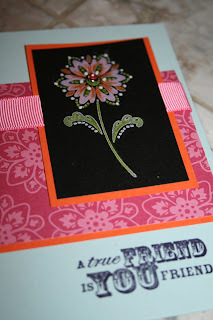 I am going to have to get some white craft ink and try this!!! Thank you so much!